The IJC's Clara Bueno receives funding of €150,000 from the AECC Foundation! 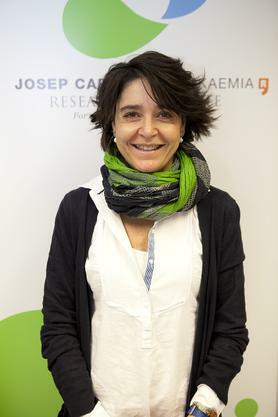 On 23 September Clara Bueno took part in an official event, organised by the AECC and presided by Queen Letizia at the Burgos Evolution Forum, at which she was awarded €150,000 over three years to fund the project entitled “Genome and Cell Reconstruction of acute lymphoblastic leukaemia (ALL) in breast-feeding babies with reordered MLL4F4". Infantile leukaemia is the most common cancer in children but the incidence of leukaemia in breast-feeding babies with reordered MLLAF4 has an incidence of one in a million. Although there have been great advances in the treatment and cure of infantile leukaemia over recent years, achieving almost 90% survival rates in which the patient is free of the disease after five years, the survival rate after five years for this sub-type of leukemia does not exceed 35%. The project is based on a first phase in which patients' DNA and RNA are sequenced in order to determine which alteration might be cooperating with MLLAF4 in the leukaemia process. Once the alterations have been identified an attempt will be made to create a model with human cells in which to reproduce the disease and thus be able to study its pathogenesis and to try new treatments that are less toxic and more effective. With this funding from the AECC Foundation it will be possible to carry out genome-sequencing studies for such patients with the latest generation of techniques.